The social structure of a colony of honey bees is fascinating. A single colony can include up to 30,000 insects, each of which performs a very specific function within the group. Honey bee colonies are well-run organizations. 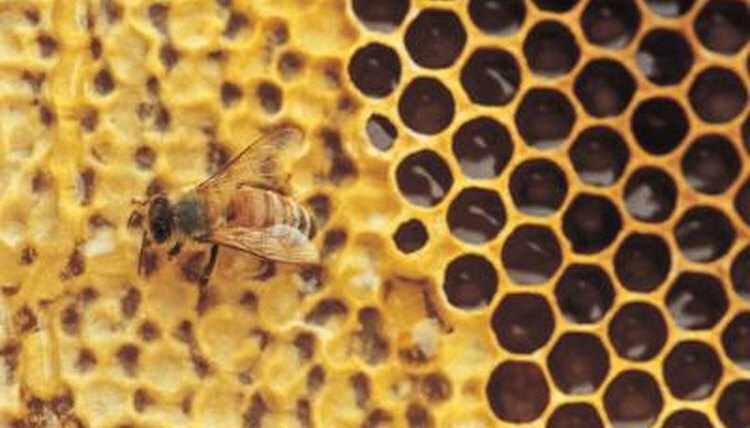 Certain bees are pre-programmed for breeding, collecting nectar, maintaining the hive or processing the collected nectar in the hive. These tiny workers have communication tools that enhance the productivity of their hive-mates. The queen's purpose is to populate the colony. She is the only sexually developed female in the group. During peak production of spring and early summer, a queen can lay up to 1,500 eggs per day, but from mid-October through the winter months, she'll produce few eggs . The queen is built for her job -- she's longer than the other bees, particularly during egg season. The queen can live up to about 5 years, but her productivity typically ends after 3 years of age. In addition to performing the reproductive role, the queen produces pheromones that unite the colony. When the queen dies, becomes lost or is removed, the bees must select a new queen from worker bee larvae. The queen candidate is hung vertically on the surface of the comb and provided large quantities of food. Eventually the queen emerges and, after a few days, leaves the hive to mate. On this mission, she flies far enough to mate with drones from other hives, to prevent inbreeding. Mating takes place high in the air, with several drones who have recognized a queen from the pheromone odors she releases. The worker bees of her colony then attend to her needs and feed her royal jelly. When she can no longer produce eggs, she is replaced by a new queen. Drones are present in the spring and summer, during mating season. They are the largest bees in the colony. They are not equipped with stingers, pollen baskets or wax glands, because their main function is to fertilize other queens' eggs. Drones become sexually mature about a week from emerging from their cells. They depend on the workers to provide large quantities food to prepare them for their one-way mating missions. They find queen bees, mate and then die instantly. Workers are the most plentiful bees in a colony. They are equipped with brood food glands, scent glands and pollen baskets, which allow them to perform duties in and out of the hive. Worker bees are responsible for cleaning the hive, feeding the brood, caring for the queen and guarding the hive. They forage for nectar, pollen and plant sap, and supply the colony with these items. Workers also help populate the colony in lieu of a healthy queen. Worker bees can communicate with each other, performing a waggle dance to direct their team members to areas where flowers are plentiful and laden with pollen and nectar. The honey bee colony is a source of endless fascination and a a model of teamwork.